Is there a list of vehicles that can be used to haul a tandem inside? ... Needless to say, no upright tandem will work on any horizontal bike rack since the bicycle is typically wider than an entire traffic lane. This is not true at all and I speak from a lot of experience. We have driven thousands of miles with out Co-Motion tandem on a rear 4-bike receiver mount rack. With both wheels still on and the handlebars turned 90 degrees only, the bike is within the width of the mirrors on either side of our Odyssey minivan. It does stick out, but definitely well within the traffic lane width and as long as you are not scraping your mirrors on other cars or walls, your tandem is perfectly safe back there. I really think a rear rack is the best solution as it seems impractical to me to go through all of the hassles of fitting a tandem into a small vehicle then not having room for your stoker to ride with you (kind of defeats the purpose). My only recommendation is that you use a receiver mounted rear rack that is sturdy enough for 4 bikes to handle the extra weight and inertia of a long tandem. 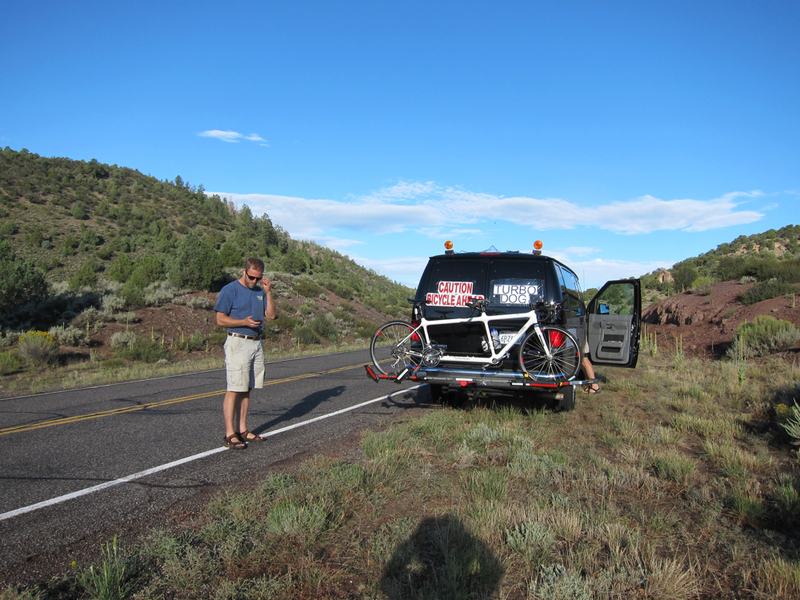 We have in fact driven more than 500 miles with 2 tandems, a single bike and a TAB on the rack and 6 people to ride them and our luggage comfortable inside the single minivan. With a good receiver mounted hitch almost any vehicle is 'ideal' for a tandem and your passengers and luggage are covered too. Anyone have any experience fitting a tandem in a Chevy Equinox? The Equinox is the largest rental vehicle that appears to be available when we will be arriving at our destination. We have a coupled Bilenky, and it will be apart for the flight, but want to assemble the bike the night before the event, and be able to transport it assembled to the start. This is not true at all and I speak from a lot of experience. We have driven thousands of miles with out Co-Motion tandem on a rear 4-bike receiver mount rack. Just for laughs and giggles, I attempted to mount our Electra Swing Tandem Cruiser to my hatch-back trunk rack, and the results are not pretty. Nevermind that the bike probably exceeds the total wight limit for the rack or that the frame is to thick to properly secure to the rack. Please note this is a crank-forward upright cruiser bike, not a "racing" tandem where the stoker's head is practically up the Captain's rear end. Either way, our 3 speed tandem rides almost like a limousine with it's long wheelbase, 8 feet total from fender to fender. It's a really smooth, fun ride though, pretty much the "Roles Royce" of Tandem bikes! Also ignore the fact the bicycle in the photo is missing it's rear wheel as I removed it and sent it to the LBS to have the hub serviced. Regardless, I hardly think driving down the road like this could possibly be considered legal or safe. As it stands, even with the angle the entire rear wheel would be completely hanging off the left side of the car, and the front wheel is more than halfway off the right. Last edited by StarDust4Ever; 09-27-13 at 04:42 PM. Regardless, I hardly think driving down the road like this could possibly be considered legal or safe. As it stands, even with the angle the entire rear wheel would be completely hanging off the left side of the car, and the front wheel is more than halfway off the right. I'll post a picture of our setup later. You really need to have a heavy 4 bike receiver hitch and probably a fullsized vehicle to do this. I would not ride your setup either. Measure and see for yourself. A medium tandem without wheels is about the same length as a 54cm -56cm 700c single with wheels. Remove wheels and use the rack on the same vehicle with the same overhang. Here are pictures of our tandem on the rear receiver hitch rack (Yakima). I took pictures from the front so you can see compared to our mirrors. This is a large CoMotion Cappuccino (700C wheels). Also, normal highway lanes are 12 feet wide so an 8 foot wide vehicle (tandem on a rack) has 2 feet on either side to the lane lines if the vehicle is centered. If a truck is 8 feet wide and centered in the lane next to you there would be 4 feet of clearance between you and the truck. We have the front wheel turned, but the wheel is still on the bike. If you took the front wheel off and straightened the handlebars you probably could slide the bike more to the driver side, but we never bother to. Some smaller vehicles are not as wide as our Odyssey, and also many vehicles taper to a narrower width in the rear (for aerodynamics), so in that case the bike is going to look a lot wider compared to our setup. For our bike to hit something we would have to hit it with our mirrors first. We have also had a Bike Friday tandem on the rack with our CoMotion and both fit within the mirror width, so I can say at least 2 tandems fit behind our Odyssey. Note the front wheel locker is down in the pic, adding to the width. The bikes are about the same width as the van's mirrors at the widest points, with the bikes secured. Last edited by uspspro; 09-30-13 at 10:26 AM. 1999 F250 Super Duty Diesel - Club Cab and short bed. 20 mpg highway. How long are your tandem bikes from end to end? My Electra Swing Tandem is about 100 inches from the edge of the rear fender to the front edge of the wheel (8'4"). Is that normal? 35100. (a) The total outside width of any vehicle or its load shall not exceed 102 inches. Our Co-Motion Cappuccino is about 8' 1" tire to fender. Dodge or Chrysler Stow and Go systems the only way to go. I've had four sequentially (99 02 05 13) and they will transport our Santana Visa with both wheels on AND THE SEATS STOWED IN THE FLOOR - Takes less than five minutes to have the entire back end of the vehicle totally open and absolutely flat. To the best of my knowledge, no other Van can do this. We could leave the right side mid and rear seat up and still fit the bike. Not "inside" the vehicle, but this is how we transported our tandems on a recent road trip from Colorado to California. It worked out well and I did have some heavy duty chains to lock the bikes when unattended. We did bring them into the hotel rooms along the way, just to be safe! I don't like having the tandems on top of the car as they seem to get a lot more weather. This is a bit of a compromise vs. "inside" the car, but I don't really want a minivan as my daily driver either. Yeah, our bike was out in the hail on the way to the Iron Horse on top of the car. Poor bike took a beating but the Di2 still worked when we got there. Our car (TDI) gets twice the mileage of Sprinter van (TDI too) so I will save the van for hauling the boat or when I want to take a LOT of toys along. Unfortunately I had to take both wheels off to get through the doors, then flip the bike on it's back to avoid having it sit on the derailleur. Also removed 3 of 4 rear seats. Tied down with bungees and seatbelts, plastic dropcloth to avoid getting the interior greasy. The roof rack wouldn't work so well on this vehicle. In a pinch have hauled our Santana in a Mercedes 300e sedan. With the 4-matic, there's no drop down rear seat but by removing the saddles + stoker bar, wheels, was able to set it at a diagonal. Sort of wish to have the wagon version with tinted windows. Would fit with ease. I don't like hauling bikes on racks. In this configuration, all I need to do is connect a DI2 cable, a brake cable, and the two couplings. No messing with the eccentric or timing belt. Wheels remain on and no brake or derailleur adjustment needed. I can reassemble the bike and be on the road in 5 minutes. The 2014 Ford Transit debuted at the LA Auto Show. There are apparently two wheelbase lengths, so the stretch version ought to accommodate a tandem. Up to 30 mpg (my Honda Odyssey gets 20). A couple nights ago I hit a small deer while driving our 2003 Dodge Grand Caravan ES at freeway speed (70mph). According to current conversations with our insurance co, it's possibly a write-off at close to $4k in damage. Sad, because this van was costing us less than $1,000/year to drive, which is far less than year to year depreciation on a new vehicle. Photo of our van in it's current condition... deer fur and all. IMO the damage to the van looks minimal but the cost to repair isn't. To me it demonstrated these vehicles are quite safe in a head on. Didn't even compress the internal bumper structure which would have deployed the air bags. We've cancelled our trip to the NWTR and a ETC event in Walla Walla prior to that. I'm looking back through this thread for ideas of alternate vehicles... I'm kind of tired of driving a minivan at this point, but it is such a useful vehicle (can fit 4'x8' sheets of plywood, etc) it's a bit hard to give up. Last edited by twocicle; 04-08-15 at 12:21 AM. I've got great anticipation on the 2015-6 Audi Q7, which will have an entirely new car platform, the same as the VW Tourareg and Porsche Cayenne, only the Q7 will be larger than these. My idea is that a tandem will fit upright inside between the two rear seats, with a modification to the center console allowing the rear wheel to slide in a groove in the center. This could be done now to the Ford Flex or Lincoln MKT, but these are too ugly. I have a Gitane which sits neatly on a receiver behind a Jeep Wrangler. The maximum width of any load here is 2.5metres, the bike is 2.3metres long. Next, the load can't exceed more than 150mm beyond the vehicle (not including rear view mirrors). When measuring from the Jeep's flared guards to the ends of the bike its 140mm so the Gitane / Wrangler arrangement is legal, thankfully! We were able to easily fit our Cannondale tandem into my Wife's 2011 Audi A6. We just removed both wheels and my seat/stoker bars and it slid right in. We even stopped for groceries on the way home. Next trick will be to get it inside my Jetta. Well, I was able to fit my Electra Tandem in my Caliber for transport to the bike shop with both seats and handlebars removed, and both the back seat and front passenger seat folded down. The interior of my vehicle is barely past 8 feet from the hatchback to the dash board. Obviously there's only room for the driver in such a senario. I've also hauled a stack of 8 foot 2x4s in it once as a favor for a friend, but the vehicle isn't really designed to haul loads like that. Regardless, removing the wheels from a tandem cruiser with hub brakes and internal transmission would be a grand PITA. We have a 2014 Ford Grand Tourneo Connect. Can fit the road tandem inside without taking the wheels off and can still seat driver + 4 passengers. The MTB tandem has to have the front wheel off to fit due to the height of the bike. All the rear seats fold flat and don't have to be removed. We have used the van for camping on cycling trips - we can both sleep inside on air mattresses with the road bike inside with us. When on an official campsite we put the MTB outside locked to the wheel to give us more space. I was looking at lots of different options but wanted something where I wouldn't have to remove the seats as we don't have a garage to store them in. So far have been pleased with the van.